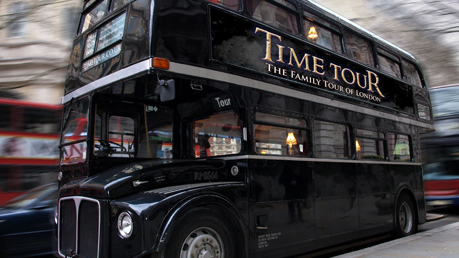 The London Time Tour Bus - A Journey Through London, Through Time! The tour is led by the one and only Professor Quantum. During the tour, the Professor shares personal tales of his experiences throughout time, whilst showing you the famous places where they happened. The tour also features interaction with actual historical figures via the Professor’s time phone, and you’ll see some of the Professor’s personal film collection of historical events. The tour lasts for approximately 1 hour and 15 minutes, depending on traffic.You will be dropped off again at our stop at 8 Northumberland Avenue. Daily tours run during school holidays with additional tours subject to demand.